Yesterday, I visited the Philadelphia Bike Expo. I saw two or three WCBC members there and I found much of it entertaining and interesting. Watching the King Cage exhibitor create a bottle cage in about 45 seconds starting with a straight piece of thin steel rod and bending it by hand around various jigs to create the cage (minus the weld-on piece to attach to the bike bosses) was a big crowd attraction. A representative from Trophy Bikes in Philadelphia gave an excellent presentation on bike security and theft recovery. I’d like to touch on some of the highlights of his talk. REGARDING SECURITY: He primarily addressed long term bike security focusing on commuters and others who might park and lock bikes for hours at a time. Quite frankly, most road riders aren’t going to carry eight pounds of u-lock and heavy-duty cable so the actual locking I’ll skip but will mention some comments he made regarding what we should lock onto and what to look for. Shake anything you’re locking your bike to. Thieves have been known to dig out signs to make their removal easy, so they can lift the sign (or even young trees) and take your locked bike. 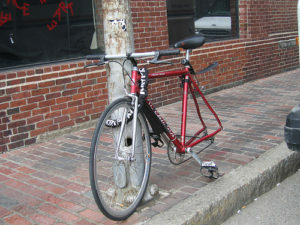 Shake “permanent” bike racks even if they are cemented into the ground. 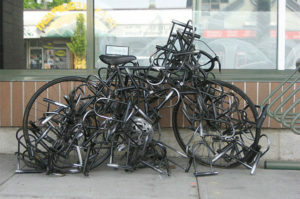 Thieves have been known to saw through the rack and cover the cuts with tape, so they can simply kick the rack apart and steal your bike. I am looking into a new, supposedly very strong and very light weight lock that roadies could carry for short term (grab a drink at WAWA or making a “pit stop”) lock-ups. More to come on that. REGARDING THEFT RECOVERY: The speaker made some excellent points. It’s difficult to recover stolen property if you can’t prove ownership. He said that he’ll sometimes get a call saying that a person’s bike was stolen, and it was bought on a Thursday in 2012. Sometimes the shop can find records and sometimes they can’t. Sometimes they are too busy to look for a while. Take a picture of you with the bike AND a picture of the bike’s serial number and keep it in your phone. That way you have immediate information to give police. Create overt and covert markings on your bike. Overt markings – Write your initials with a silver sharpie on you tire. Yes, it detracts from your bikes ambiance, but no one sees it when you’re moving. If you don’t want to mark your tires, find some other method to obviously mark your bike that you can live with. Remember that stickers can be easily removed in most cases. 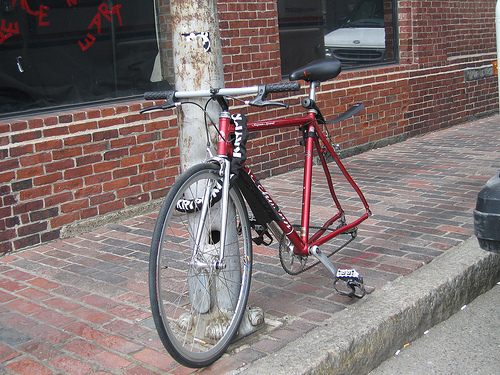 This helps bike shops you’ve notified of the theft to spot your bike should it show up for repair or sale. Covert markings – Place a dab of paint or nail polish high on the inside of your forks and seat stays. Use the same color as your frame so it will be invisible. The texture will be evidence of your marking. Make a police report. 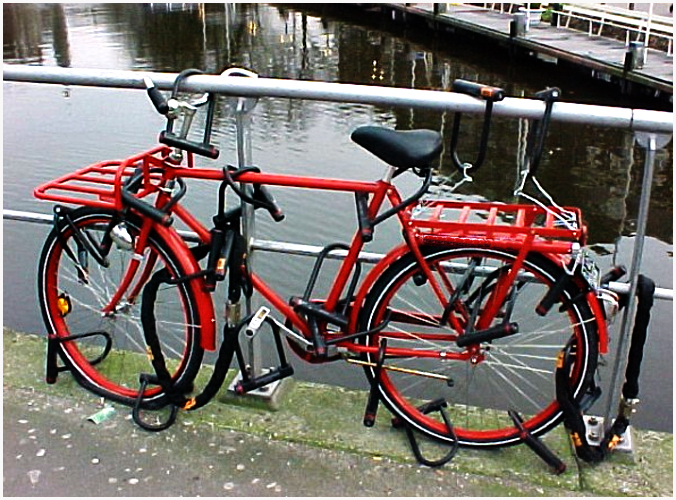 Include the bike and serial number pictures and the overt and covert clues above. This helps bike shops when calling that they have a stolen bike. Finally…his words not mine…Police generally make bike theft a low priority so the easier we can make it to identify the bike the better.